They broke into my sea of problems rushing through my brain as I cleaned the house. There was a slow pounding to them as if sorrow was leaving the body and finding it’s own center. I hadn’t heard any music, at least not from the piano for two months. A half-smile split my thoughts apart. My daughter finally played it. 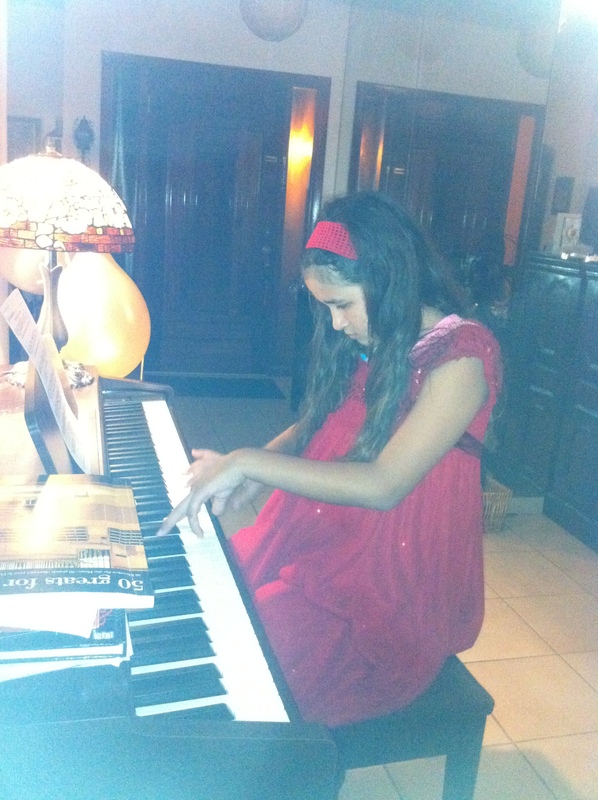 Her piano teacher and mentor left for New York City a couple of months ago. She was the opposite of Daisy, my daughter. She smiled all the time and laughed a lot too. Most people who do this too much make me very nervous because I feel like they’re trying to cover something up. But, Daisy who normally carries a serious demeanor found her teacher refreshing and inspiring. I did too. Then she left. Since then, Daisy has avoided the piano, which she used to play every day. She abandoned it in a sort of mourning process because she really loved this teacher. Even though her school has a piano teacher, we’d leave school at four and drive a half hour through heavy traffic to another school, a school where rich kids played tennis and housed a special piano teacher. In a second-floor room, they sat and played. I took my shoes off and lay on the floor in a desperate attempt to fix my aching back. Between the hard floor and the therapeutic drop of each piano key, I was a new person at the end of each session. More importantly, Daisy smiled and pushed back her shoulders that normally curled inward out of insecurity. After two years of lessons, I realized, watching and listening to them together, that this very young woman wasn’t just her teacher. She was her mentor. She was her mentor because she held Daisy to a standard above which desire met talent. She was an artist. This mentor wasn’t just teaching piano. She was a pianist and a singer. So, the respect Daisy felt for her flourished on a level beyond teacher and student. When she left, well, she took Daisy’s soul. So, when the notes spilled into our house this last week, I smiled the smile of an artist who knows heartbreak. My eyes filled with tears but none spilled over. I sent this link to one of my best friends who I am proud to say is a piano teacher like the one you shared about here. Thank you for your post. You should probably send this link to the one you write about. I know if I read this and it were about me… It would make my year! Great post! Thank you for passing it along. I love that you see what I see in my writing. Yours offers the same to me. And, I will send it to her mentor, thank you for that advice too! I don’t think she took Daisy’s soul. She added something to Daisy’s soul. Lot of emotions flowing through the post.Yes it was indeed very touchy. Thanks for posting! It’s amazing how much effort is put into our children…your post brought tears. I do and I wouldn’t have it any other way. Thank YOU! Love it. Nothing better. I couldn’t help smiling ear to ear last night when I heard my son playing ukuele with his instructor while she sang along and he played Cee Lo Greene. They were magical. Lisa, thank you for taking the time to stop and like a post today. It is appreciated. I look forward to following a blog with so much bravery, smartness, and boldness. I am thinking I cannot go far wrong.